Ever since Raul Castro became Cuba's President in February 2008, people—at home and abroad—have been waiting for changes that would improve living conditions on the island. But the changes have been slow coming and there are indications that when they do take place they might not be the ones hoped for. For three days this week, the official Communist Party daily, Granma, has front-paged statements made in the 1970s and 80s by former President Fidel Castro. They are all variations on the same theme: too many people being employed to do too little, and low productivity as the bane of the economy. He also warned that at some point there would be more university graduates than openings in their fields and that students should view their degrees as an honor but not necessarily as a ticket to a professional career. Castro's statement printed last Tuesday focused on "inflated" payrolls. Inside the same newspaper was an article announcing that the Ministry of Agriculture would be cutting thousands of bureaucratic jobs. Twenty-six percent of their employees - 89,000 people - it said, were office workers resulting in an "excess of unproductive personnel." Cubans fear that similar layoffs will come in many other sectors of the economy and that Granma's publication of Fidel Castro's views—if dated—on the issue are rather like trying to put the "Good Housekeeping Seal of Approval" on what are bound to be unpopular if necessary measures taken by his younger brother Raul. Raul Sarmiento, a retired University of Havana professor of political economy who for many years reported on economic issues for Cuban TV, sees the payroll cuts as part of the effort to save money and reduce subsidies but is unwilling to say that those laid off will be left to scrape by on their own. "These are bureaucrats who don't produce anything … I don't think unemployment will go up but that these people who are now a burden on the economy will be relocated in jobs where they actually produce something," Sarmiento says. He wouldn't specify where in the economy they could accommodate tens of thousands of newly unemployed white collar workers. Cubans are closely watching every step taken. "People are very tense," said a foreign ministry employee and specialist on the Caribbean. "The ration book is flying out the window," she said, asking not to be named because she was not authorized to make statements to the press. The ration book she refers to is a thin drab brown pamphlet the government issues annually to every Cuban family. It entitles them to a series of basic products—rice, beans, eggs, etc.—at highly subsidized prices. 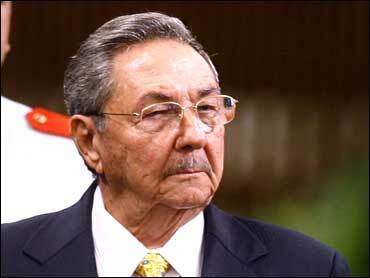 Earlier this year President Castro said his "maximum priority" was increasing domestic agricultural production. It's an understandable goal as international prices have gone up and Cuba depends on imports for over 80 percent of the food consumed by the population of 11.2 million. But to cope with the global economic meltdown, $10 billion in damages from three hurricanes in 2008 and a liquidity crisis, Cuba has been forced to reduce spending: imports were cut by 30 percent, and overall trade is down by 36 percent to about $10 billion so far this year with about 80 percent of that being foodstuffs, according to Foreign Trade and Investment Minister Rodrigo Malmierca, who spoke at the recent International Trade Fair in Havana. The official state-owned media has been floating trial balloons on cost cutting and import substitution. Some of what they suggest has begun to be implemented, at least in part. In October, the Communist Party's daily newspaper Granma published a full-page editorial saying it was time to do away with the five decade old rationing system. It went so far as to compare some Cubans to "baby birds," waiting to be fed by "Daddy state." That description drew criticism from many people who have long complained about the "paternalistic state" that left them little room for individual initiative. The follow-up to that editorial was the recent removal of two basic products—potatoes and dried peas—from the ration book. Now they are available in unlimited quantities but at substantially higher prices - as long as the supplies last. Prior to that, cheap state-subsidized lunches were eliminated on an "experimental" basis from four government ministries whose workers had regularly eaten in on-site cafeterias. Wages were raised by 15 Cuban pesos a work day to compensate. And to encourage employees to "brown bag it" one of those ministries, the Ministry of Economy and Planning, has installed microwaves and a city food service has taken over their lunchroom and is offering reasonably priced meals in Cuban pesos. All of this represents major changes in Cuba's system. So much so that all the chatter in a doctor's waiting room last week focused mainly on the potential disappearance of the ration book. Like her patients, the woman general practitioner, a single mom supporting a 9-year old daughter and a mother in her 70s, worries how she will get by on her salary. She already illegally sells her Internet password—provided by the Health Ministry—for 250 Cuban pesos a month. Cuban economists have long debated the subsidized rations. Most have argued for providing aid to families in need rather than subsidizing products for everyone. But the ration book is a nearly 50-year-old institution and the thought of losing it provokes panic in many quarters. Clara, a housewife, and Pedro, a retired administrator are both in their 80s. In their younger years, Clara took in sewing and with her earnings and her husband's salary, they did alright. Now they are forced to live on Pedro's 200 peso monthly pension. They buy everything available on the ration book at their local grocery but they resell the extra sugar and rice to their neighbors at prices well above what they paid for them. They wonder what they will do for extra income if the ration book no longer exists. "Some people don't buy the chicharos or dried peas but some families depend on them," says Alina, a hotel restaurant employee in her 40s. Looking doubtful she added, "We'll have to wait to see what happens." Alina, like other tourist industry worker, is part of a privileged group whose income from tips gives them a living standard way above the average worker. But now they say their income is down because although tourists continue to vacation in Cuba they are spending less because of the economic crisis in their own countries. Besides the problem of putting food on the table more cheaply Cuba is also facing an energy crunch which is bound to become another irritant of everyday life. In June, government offices, factories and schools were ordered to substantially cut electricity use. Air conditioners were only allowed to be used for about three hours a day despite the unseasonably warm temperatures. In Havana, the enterprise providing information services for the national transportation industry, SITRANS, has a windowless room full of computer servers and other equipment worth tens of thousands of dollars. But the IT employees there are prohibited from turning on their air conditioners before 1 p.m. and by 4 p.m. they must be turned off. "It's only going to be a matter of time before the equipment begins to break down. My co-workers are already suffering from the stifling heat," says one of their specialists, who asked us not use him name. Now State enterprises are being asked to save even more energy during the remainder of 2009. A memo circulated by the Ministry of Light Industry to factories and work centers under its control says Vice President and Communications Minister Ramiro Valdez has ordered them to take "extreme measures" in order to avoid having to resort to programmed blackouts in residential neighborhoods. Among the measures to be implemented immediately is a total ban on air conditioning. Production, except for export goods and essential domestic products, will be shut down. Commercial refrigeration will be turned off unless they hold perishable food or medicines. Even security lighting will be reduced to the minimum. Similar memos have gone out to other sectors of the economy and to provincial and city governments. Already residents of the eastern city of Santiago de Cuba are complaining about reports that street lights will be turned off. "The most common complaint is that the absence of street lighting will be dangerous," says law professor Miguel Martinez. "Increased crime and hilly streets that are difficult to navigate even in daytime will make for an unhappy mix," he points out. It's unclear if the current energy crunch is simply a result of people having used more fuel than the country has money to pay for during an extremely hot Spring and summer or if there are other factors that have not been made public. Cuba receives over 90,000 barrels a day of crude oil from Venezuela on very favorable terms that involve providing that country with medical and other professional personnel. Some Cuban analysts we spoke with speculated that Cuba might be reselling some of that oil in an effort to boost its cash reserves but it has not been possible to confirm that. There is a belief, however, that President Raul Castro is trying to deal with the problems of his cash-strapped economy in ways that will provoke the least instability. But that doesn't mean he will hold back on changes he deems necessary.